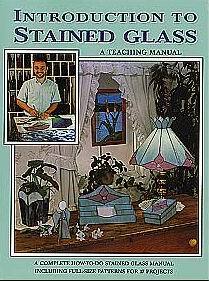 Excellent beginner's instruction book.A comprehensive do-it-yourself manual providing in-depth step-by-step information on tools, supplies and techniques. Instructions include pattern making, glass cutting, fitting, soldering, and finishing for both copper foil and lead came assembly. Lamp making and other special techniques are also covered. Seventeen project patterns are included ranging from Sun catchers, boxes and small windows to stained glass swag & table lampshades. 70 pages.